This component handles data structures for the code of the current module and for all information about it that may be necessary to precompile that module. Since CiaoPP works in a per-module fashion, when preprocessing one module the modules imported by it may not be accessible. However, information on imported predicates may be essential for some manipulations of the current module: e.g., for analyzing it with greater precision. For this reason, information about exported predicates of a module is stored in separate cache files. The cache files of modules imported by the current module are then loaded together with the file of the current module. All the information stored together with the current module is called the preprocessing unit of the current module. Cache files are used to save assertions that refer to exported predicates, properties exported or properties that are used in assertions for exported predicates, and properties used in the definiton of other relevant properties. (The exact definition of what is cached and how the preprocessing unit is obtained from this caches is given in the chapter for p_asr). This facilitates the use within CiaoPP of all information that may be relevant about exported predicates that may be imported into other modules. This information from (user) assertions is extracted from the module code. Other information that may be relevant is that inferred by CiaoPP on its own. The information from analysis that refers to exported predicates of a module is also cached in separate files, so that the preprocessing of other modules that import such predicates can use the information. Currently, separate files are used for user supplied assertions (the so called .asr file) and for information from analysis (the so called .abs file). Module p_asr is in charge of the .asr file and module p_abs is in charge of the .abs files. More information concerning the current module that this component serves includes: initialization directives, entry assertions that may need analysis, whether a predicate is a meta-predicate or a dynamic predicate, whether it is a "builtin", a property, or a native property, etc. In the sections below we explain what is understood by builtin predicate and native property. The complete functionality offered by this component is explained in the following chapters. the properties transitively used in the definitions of all the previous properties, whichever file they are defined. Note that once the preprocessing unit of the current module is loaded, every assertion for a predicate of the current module or imported into the current module can be correctly and completely interpreted, since all the properties that may appear in such assertions (or transitively used in the definitions of such properties) are available. This is the main reason for including the preprocessing unit of the current module instead of simply loading the current module itself alone (and some assertions for imported predicates, probably). 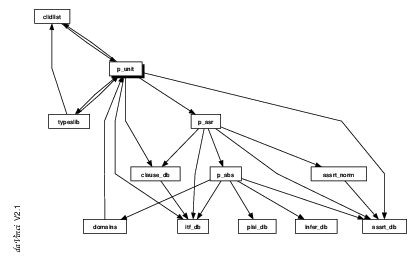 A predicate is builtin if there is information about it built into one of the components of CiaoPP. This is the case, for example, for analyzers. Usually, these predicates are ISO predicates, whose semantics conform with the standard, and thererefore, can be implemented into CiaoPP once and for all. The names used to refer to these predicates are thus usually also the ISO names. :- pred var(X) + native(var(X)). This assertion in module term_typing tells CiaoPP that predicate term_typing:var(X) corresponds to the predicate builtin into CiaoPP as var(X). Note that the name var/1 should be used all throughtout CiaoPP to identify that very same predicate (the one in ISO by that name, in this case). This is mandatory. Note also that with the above scheme, the only real predicate name that is built into CiaoPP is that for the property native(Pred,Name), which currently is precisely native(Pred,Name) (which is currently defined in library module engine(basic_props)). A property in Ciao is a predicate. Certain properties are used within CiaoPP in a native way, which means that some component understands the property natively (for example, an analysis for groundness understands the property of being ground). These properties are called native properties . :- prop var(X) + native(free(X)). This is interpreted by CiaoPP so that predicate term_typing:var(X) corresponds to the native property identified in CiaoPP as free(X). Note that the name free/1 should be used all throughtout CiaoPP to identify that property. The names of native properties are defined in native:native/1. The (default) predicates that are used as source language level counterparts of the native property names are gathered together in a Ciao library module that currently is library(assertions/native_props). There is an scheme for translating predicate property names to native property names upon input of the current module, and native property names back to predicate property names upon output that is described in the chapter about module domains. Module p_unit is in charge of supporting all other CiaoPP components when they require information about the program. Module p_asr is in charge of processing the .asr files and gathering together the preprocessing unit for the current module. Module assrt_norm is used to normalize assertions. Module p_abs is in charge of reading .abs files and writing them. Module assrt_db maintains the database of assertions, module clause_db the database of clauses, and module itf_db the database of information related to the module interface of the current module. Each of the modules is documented in the following chapters.